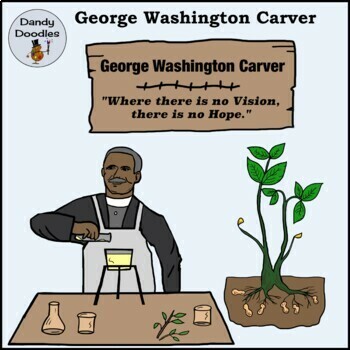 George Washington Carver (1860-1943) was an African American who was born into slavery, He became a botanist, inventor, and an educator. 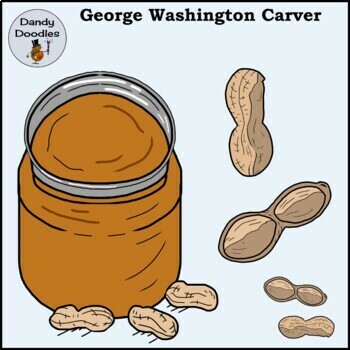 He is best known for his extensive research on peanuts. 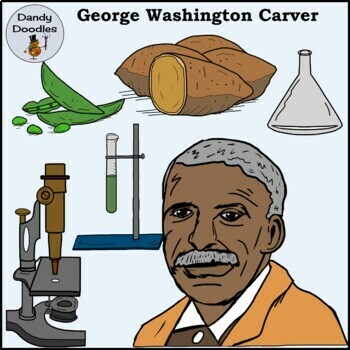 Carver's experiments focused on teaching farmers to utilize "alternative" crops such as sweet potatoes, soy beans, cow peas, and peanuts to replace expensive crops/commodities, most notably cotton. 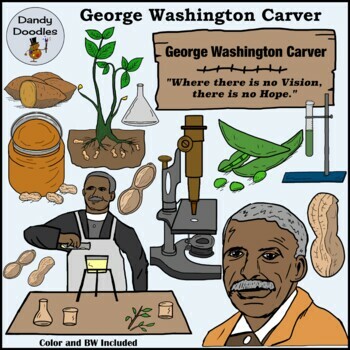 This George Washington Carver Clip Art set features 26 PNG images (13 color and 13 Blacklines) Included are two images of Carver along with peanuts, peanut plant, a jar of peanut butter, sweet potatoes, soy beans, test tubes, beaker, microscope and a famous quote from him. The set will download as a zip file which is easy peasy to open! You'll then see your individual images and will be good to go! TOU: Feel free to use our clip art in your products, classroom, on your Blog, or on your website. If you use our images, you must link back to our TpT Store somewhere in your document or on your site. To make it easier for you, we’ve included a button you may use to serve as credit given. It’s up to you which one you use. It’s in the download as a PNG image.